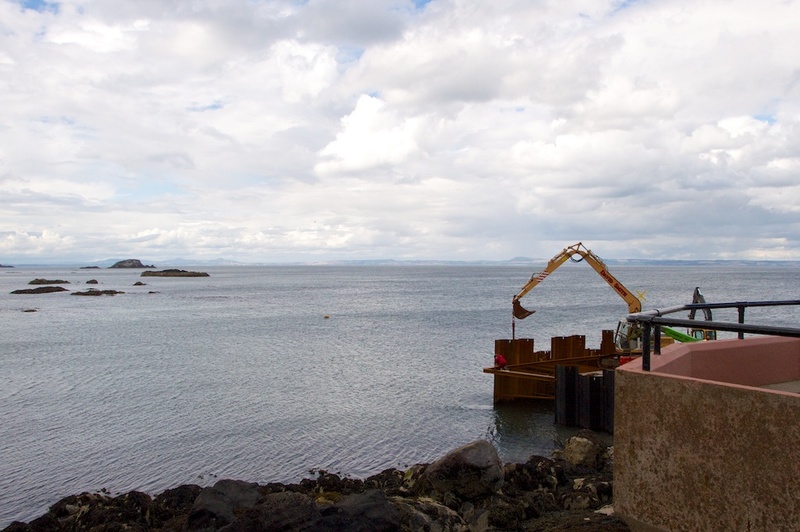 Earlier this year I mentioned the pretty harbour of North Berwick in a fun quiz. The harbour is now full of pleasure craft, but it has a long and fascinating history. Once a thriving fishing port, from the early 1800s it was also a busy hub for exports of grain, wood, iron and steel; and in the middle of the 12th century it must have been a fascinating place, because something like 10,000 pilgrims were passing through here every year on their way to St Andrews. From North Berwick, a ferry would take them across the Firth of Forth to Fife, where they continued their journey on foot. 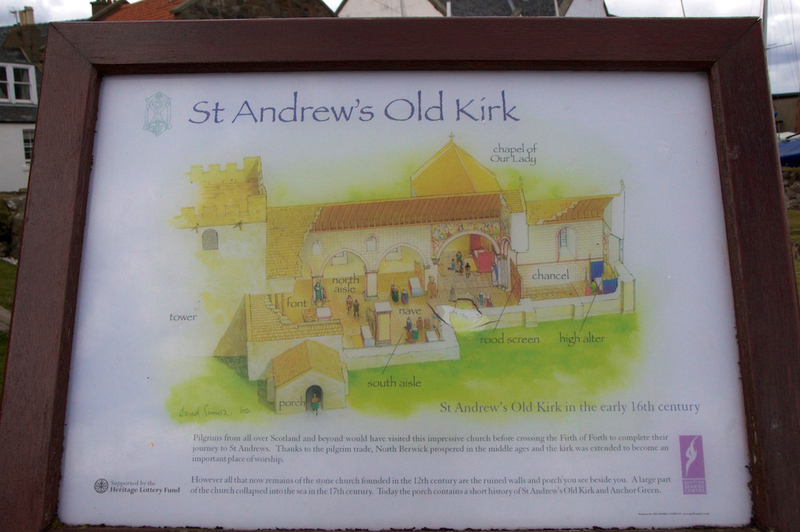 Many of the pilgrims would have been frail or sick, hoping for a miracle when they reached the sacred shrine that contained the relics of St Andrew; and it was for them that Duncan, Earl of Fife, founded a hospital on the harbour of North Berwick in 1154. Next to it stood a church, and here the pilgrims would pray for safe passage over the sea. Today, the only part of the church that remains standing is a small white-harled building that was once the porch. St Andrew’s Auld Kirk. You can just glimpse the harbour through the gap on the left. That’s a modern statue, by the way! Is the church even older than the hospital? 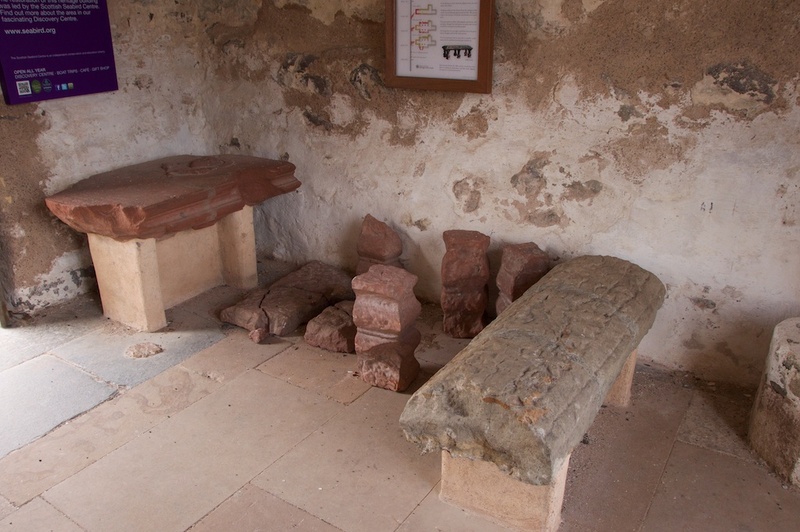 The first written evidence occurs around 1177, but before that there may have been a small chapel on the site, established in the 7th century by St Baldred. 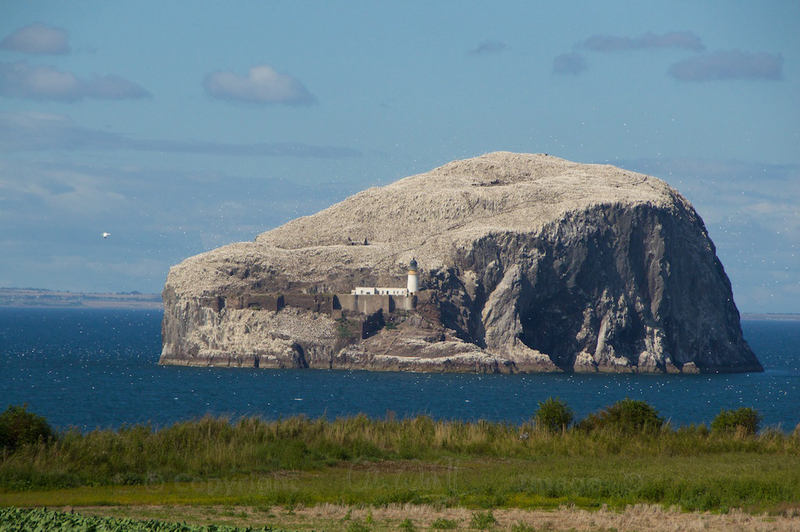 Bass Rock. You can make out the roofless chapel just above the lighthouse (click to enlarge). The birds are gannets! I can’t ignore someone whose name reminds me so much of Baldrick from Blackadder, so I had to find out about him! Known as ‘the Apostle of the Lothians’, St Baldred is believed to have been born in Ireland, but he migrated east in order to spread the word of the Gospels. 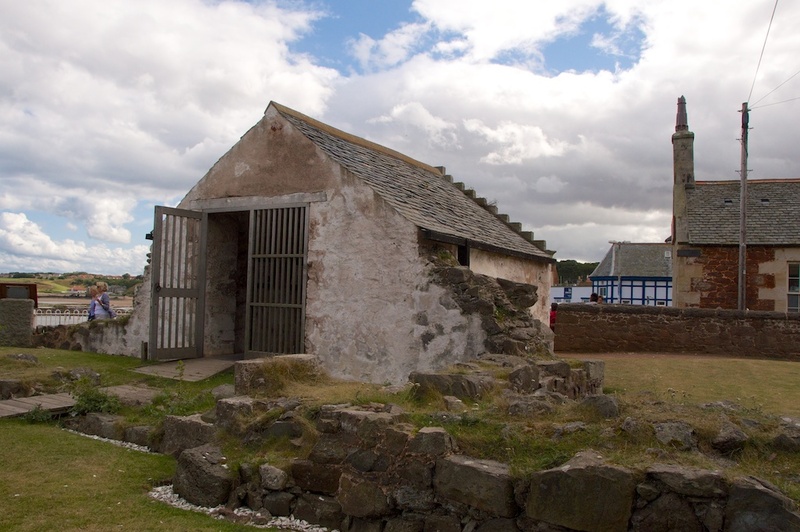 Having joined the monastery at Lindisfarne in Northumbria, he established a monastery at Tyninghame in East Lothian. If St Baldred and the other holy men of his day had been browsing for holidays on the internet, their search terms would have been ‘solitude’, ‘deprivation’ and ‘sea views’. About half-way up the bleak, treeless island of Bass Rock in the Firth of Forth, a ruined chapel marks the spot where St Baldred built a hermit’s cell, and he is said to have died here around 756 AD. At least he can’t have been lonely in the summer months – he would have had 150,000 gannets for company. On the mainland, a rocky promontory below Tantallon Castle is still known as ‘St Baldred’s Boat’, which (in my imagination, anyway!) 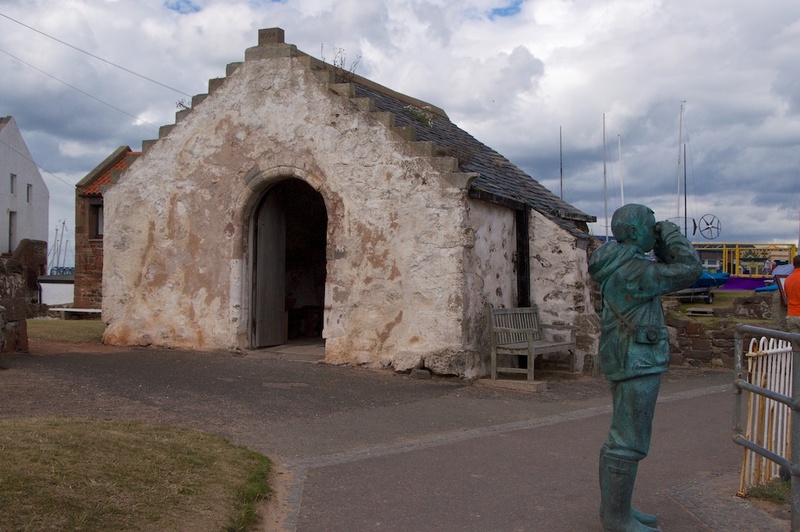 could mark the spot where he set sail for Bass Rock; and above Seacliff Beach is a natural cave known as St Baldred’s Cave. 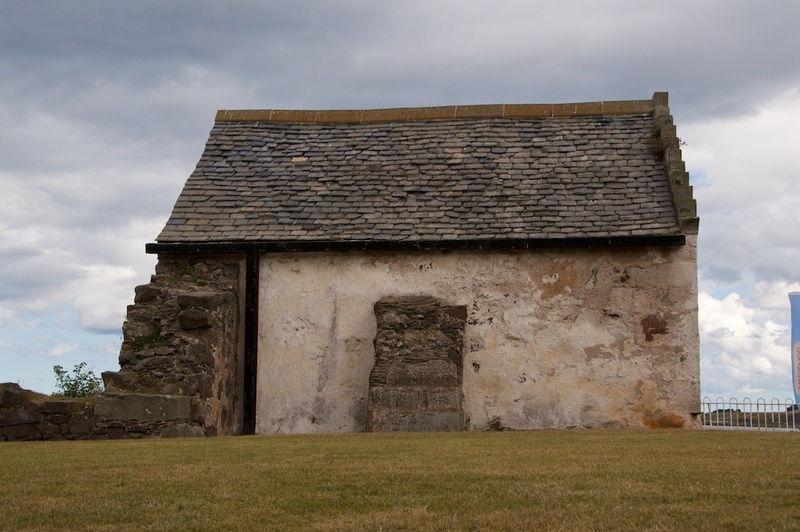 Whether or not the church in North Berwick occupied the site of one of St Baldred’s chapels, it was not best placed in terms of the weather. Sitting on a peninsula, it was vulnerable to damage from north-easterly gales and high seas, but it offered convenient access for pilgrims embarking in the harbour. A report published by the Society of Antiquaries of Scotland adds that “It was reachable only by a bridge or causeway, at first of timber, though later of stone…” Records show that the church and its causeway were damaged by winter storms, and by the mid-1600s the church was in ruins. No trace now remains of the 12th century hospital founded by the Earl of Fife, and it is believed that granaries were built on the site in later centuries. As for the church, the remaining porch probably wasn’t part of the earliest structure, which consisted of a simple rectangular building. Later additions included a side chapel and a tower, and these, together with the nave and chancel, are now visible only as rubble walls and foundations. If your imagination struggles a bit here, you are helped by the illustration on the information board outside. 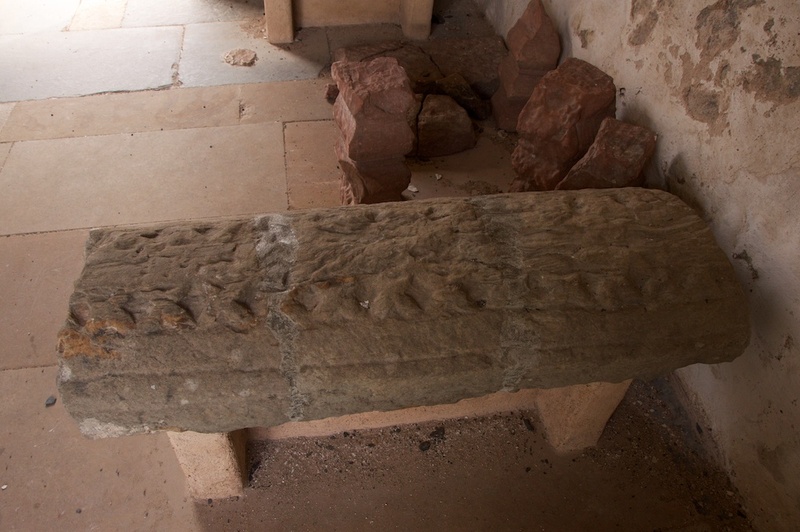 The adjacent graveyard has suffered erosion from the sea, but this process has turned up several archaeological finds. A piece of a stone mould for making pilgrims’ badges was picked up, and is now in the North Berwick Museum. I love the idea of pilgrims buying souvenirs from the seaside! I bet they would also have enjoyed some fish and chips – there’s a good stall on the harbour. Today, the church seems like a little knot in the fabric of time, largely by-passed by day trippers strolling along the sea front and visitors heading for the nearby Seabird Centre. It’s hard to photograph it without including at least one person in a t-shirt and flipflops, but after all, it has been at the heart of a very ancient tourist industry – and if there are any spirits still wandering around the ruins I don’t suppose they’re bothered at all. 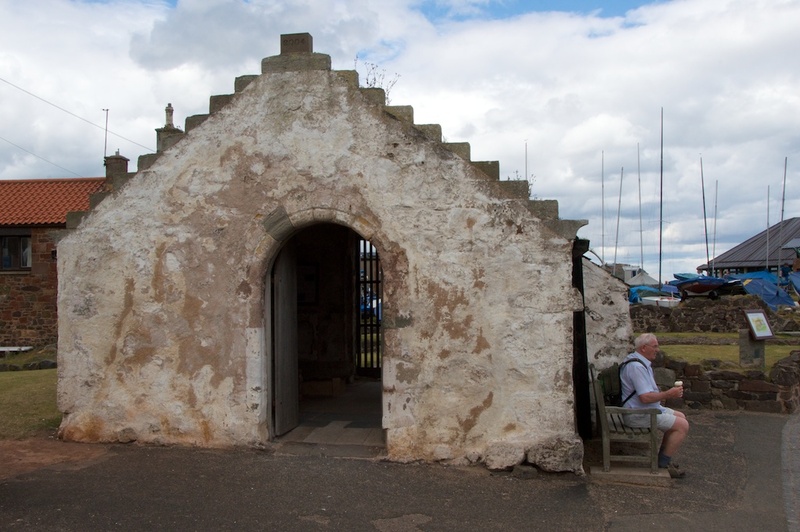 Just to confuse matters, North Berwick has another church dedicated to St Andrew, which was built in the mid-17th century after the collapse of the first one. 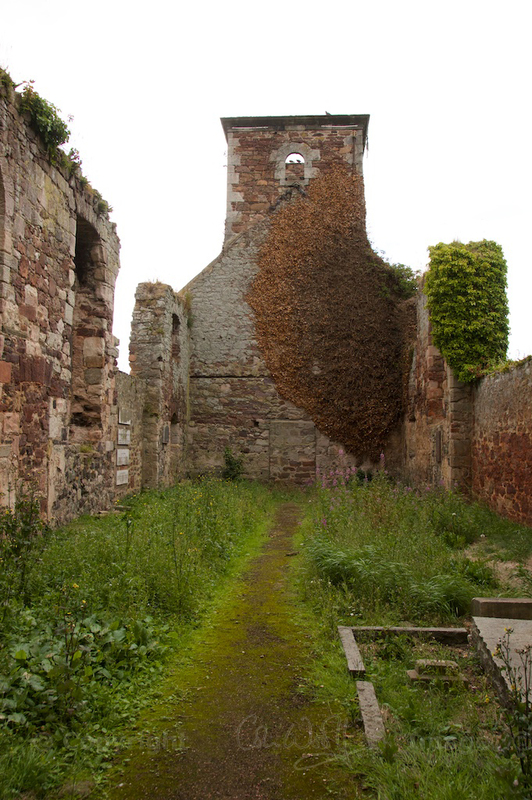 Known as the ‘Parish Kirk’, this is now in ruins too, although it obviously can’t be described as ‘Auld’. I will tell you about this one presently – and this time there really is a connection to a man called Blackadder, although there’s no link to the TV series as far as I’m aware! 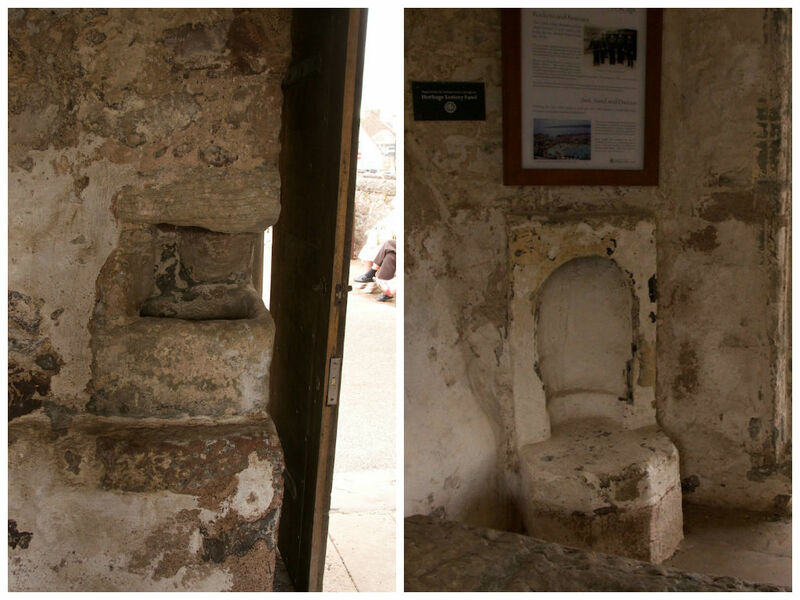 Meanwhile, if you’d like to find out more about the spiritual heart of St Andrews, a medieval magnet for thousands of pilgrims, please take a look at my features on St Rule’s Tower and St Andrew’s Cathedral. Very much appreciate your blog! I so enjoy your histories. I can’t imagine being seriously ill and making that kind of journey. And yet seems as long as there has been religion, people have done it. Thank you, I’m so pleased to know that! 🙂 Yes, if you were ill or crippled, the idea of a journey like that must have been ‘make or break’ – you might not even return – but in so many cases I think it was the faith itself that cured them. What an interesting wee building. You have to love the nonchalant way a 13th century gravestone is just sitting there. I’d like to hope that there are processes in place to monitor and protect the building. Yes, the building seems a bit incongruous, mainly because it’s so small – and to have those relics inside there is both a nice surprise and also (I guess) a slight worry, although none of them are light enough to be carried off! I do not think it is protected by Historic Scotland but there is a museum in Berwick which probably keeps an eye on the place. Thanks, Lynne! We really only found it by accident but it’s well worth a visit. I think you would love it! All these times I’ve looked at the Bass Rock from the shore and didn’t realise there was a chapel on it. He was a brave man, that Baldred, living amongst all those gannets. Next time I’m in North Berwick I’ll be sure to take note of that porch. I vaguely recognise it but am ashamed to say I’d never considered it properly before. A fascinating history and amazing to me that it’s still standing there. I didn’t realise it was there either, Lorna, until I enlarged one of my photos! I couldn’t believe it at first – it doesn’t look physically possible. Baldred can’t have got much sleep in the summer, that’s for sure. Yes, North Berwick seems to be full of surprises! I love the way that old church is just standing there with all the holiday makers milling around it. Great article and I love the picture of the harbor! Thank you! 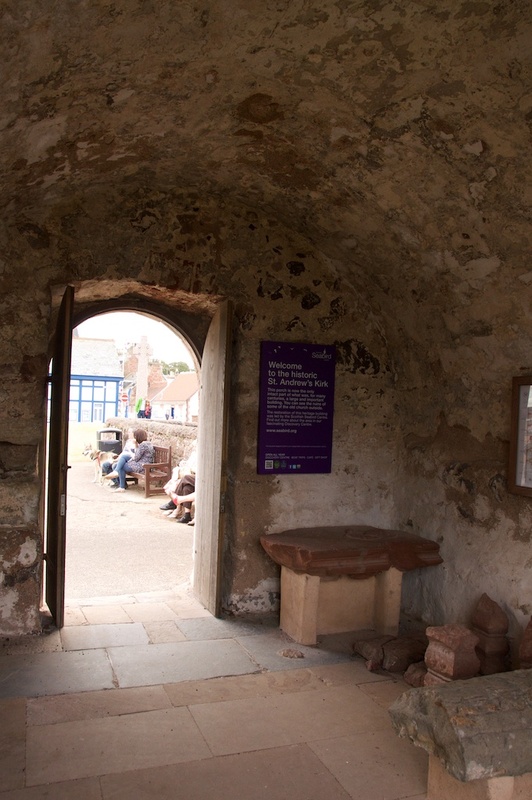 North Berwick is such a lovely little place, full of so much interest – you’d love it!